Well, after over 2 years of doing astrophotography and fighting the MEADE LXD75 mount, I decided to upgrade to a ORION Atlas EQ-G mount. I have said it before and will say it again, the LXD75 is a pretty good mount for the money. It's hard to beat for around $600. However. it has its limitations. The periodic error can be a problem even if you try to compensate for it using the Periodic Error Correction function in the mount. The material used and quality could be better and the computer Hand box seems to have a mind of its own. My experiences with the LXD75 have been varied. Some times it worked almost flawlessly other times I threw up my hand in frustration and went to bed because it wouldn't track properly or had some other problem. I must say, though, that I learn a lot about how to use an equatorial mount and the computer control. When I first started this hobby and asked people what equipment I should look for, most said get the best mount you can afford. Put the majority of your budget into the mount. Now I know what they were talking about. The EQ-G is head and shoulders above the LXD75. This unit is massive. The mount alone weighs over 40 pounds. The workmanship and quality looks to be superb. All the electronics and motors are built into the mount shielding it from bugs and weather. When slewing the mount is extremely quiet. No coffee grinder noise that you sometimes get with the LXD75. The GOTO's are spot on. All in all You can't get a better mount for the price ($1500). Certainly there are better mounts available but they are way out of my budget. At right is a shot of my current setup. One of the things that impressed me was the polar alignment with this mount. Orion places an image of the big dipper and the constellation Cassiopeia on the reticle of the polar scope. All you have to do is rotate the RA axis until the position of Cassiopeia and the Big Dipper match that of the position of the actual constellations in the sky. Once you have that all you need do is adjust the azimuth and elevation screws on the mount to put Polaris in the little circle that you see in the reticle. I followed that procedure and was amazed at how close the polar alignment was. The EQ-G comes with an new dovetail plate which must be mounted to the OTA rings. In my case the MEADE dovetail bar did not fit the mounting place on the EQ-G. Two longer 6mm screws is all that was required to attach the new plate. Computer controlling the EQ-G required the installation of ASCOM , EQMOD and an appropriate planetarium program. I chose Cartes du Ciel (Sky chart) because it's one of the more popular program used. ASCOM ( Astronomical system common interface) and Carte du Ciel (planetarium program) and EQMOD ( Ascom interface driver for EQ-G type mounts) are free. You can get the Ascom system at http://ascom-standards.org/Downloads/Index.htm . EQMOD is available from http://eq-mod.sourceforge.net/ and Cates du Ciel is available at http://astrosurf.com/astropc/. All programs come with well written documentation. If you are interested in more info on the EQ-G, Andy's Shot Glass http://andysshotglass.com/atlas.html has a great video that shows you how to align the EQ-G as well as doing the polar alignment. Looking forward to many pleasant nights imaging with the new setup. Finally had some decent conditions for imaging and played around with the EQ-G to get familiar with how it works. While I was at it, I took a few shots of M33. I found the mount to be extremely quiet while slewing and , once aligned, the GOTO's dead on. In using PHD to auto guide the mount I found that the graph was almost flat with only a slight ripple in the RA and DEC axis. Needless to say I am very pleased with the purchase. One thing that I found, and was suggested in the EQMOD users guide, was the that you almost have to use a GAME PAD to control the mount while you are setting things up for the night if you are using EQASCOM. It doesn't matter if you are using the HAND BOX in PC Direct mode or and EQDIR interface module from Shoestring Astronomy. When you use the hand box in the PC DIRECT mode and EQASCOM to control the mount you cannot use the hand box to manually move the telescope. Doing so will mess up the EQASCOM connection. Unless you have a GAME PAD, that leaves you with one option, using the controls in EQASCOM from the key board on your PC. I tried using the keyboard for a while but found it almost an impossible combination. With the finder scope on one side of the OTA and the PC on the other it was back and forth, got to the keyboard and move the mount a bit and back to the finder to see how far it move. and back and forth till the star was in the middle of the screen. This got old real quick. As you imagine I purchased a Logitech Rumble Pad 2 and am using that now. You can get a wireless or USB game pad. Recently I made another purchase (this hobby is like a black hole sucking up all your spare cash). While out one evening familiarizing myself with the new mount I had issues with the PC direct mode of the Hand box. For unknown reasons the hand box reset a couple of times. this messed up my EQASCOM connection and my polar home position. Each time I had to re-align the mount. Setting it to polar home then restarting EQASCOM, finding some starts to sync on in the planetarium program and centering them on the screen. After the third time I gave up and went to bed. 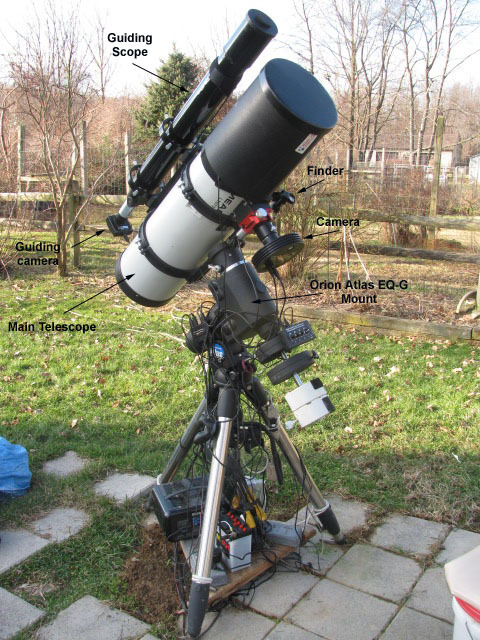 To eliminate the need for the Hand box I purchase a EQDIR module from Shoestring Astronomy (see link above). This unit connects to the 9 pin D connector on the mount where the hand box normally connects. It allows EQASCOM to talk directly to the mount's controller board without first going thru the hand box. I haven't had a chance to try this out yet since mother nature hasn't been cooperative, but will soon.